The global spectroscopy instruments market is segmented on the basis of products, applications, and regions. Based on products, the market is categorized into EDS, WDS, EBSD, and Micro-XRF. The EDS segment accounted for a major share of the spectroscopy Instruments market, by product, in 2014. On the basis of region, the spectroscopy Instruments market is divided into North America, Europe, Asia, and the Rest of the World (consisting of Latin America, the Pacific countries, the Middle East, and Africa). The key factors that are expected to spur the growth of spectroscopy Instruments market are the growing semiconductors industry, increasing demand for nanotechnology, demand for automobiles, and technological advancements. On the other hand, the high cost of instruments, sluggish economy (especially in the European countries and the U.S.), and lack of trained professionals are restricting the growth of this market to a certain extent. Some of the major players in the spectroscopy Instruments market include Oxford Instruments plc (U.K.), AMETEK, Inc. (U.S.), Bruker Corporation (U.S.), Thermo Fisher Scientific, Inc. (U.S.), JEOL Ltd. (Japan), FEI Company (U.S.), Shimadzu Corporation (Japan), Rigaku Corporation (Japan), and IXRF Systems, Inc. (U.S.), among others. The global spectroscopy Instruments market is dominated majorly by four players, namely, Oxford Instruments plc, AMETEK, Inc., Bruker Corporation, and Thermo Fisher Scientific, Inc.
Based on products, the spectroscopy Instruments market is categorized into EDS, WDS, EBSD, and micro-XRF. The EDS segment accounted for a major share of the market, by product, in 2014. 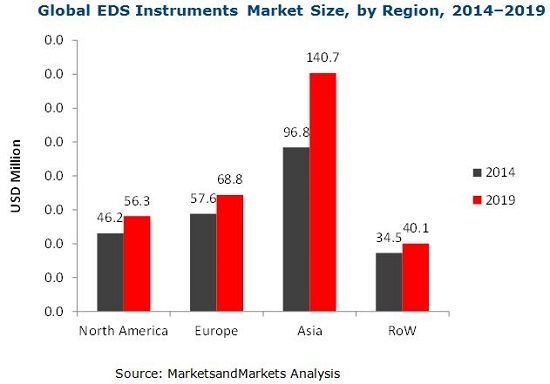 The semiconductors application accounted for a major share of the EDS market, by application, in 2014; whereas, the oil and gas dominated the WDS market, by application, in 2014. The manufacturing application accounted for the largest share of the micro-XRF market, by application, in 2014. The EDS, WDS, EBSD, and micro-XRF instruments market has registered constant growth over the years. Factors such as the growing semiconductors industry, increasing demand for nanotechnology, demand for automobiles, and technological advancements are propelling the growth of spectroscopy Instruments market. On the other hand, the high cost of instruments, sluggish economy (especially in the European countries and the U.S.), and lack of trained professionals are limiting the growth of this market. On the basis of region, this market is classified into North America, Europe, Asia, and the Rest of the World (RoW). The global spectroscopy Instruments market is expected to reach USD 529.6 Million by 2019 from USD 403.6 Million in 2014, at a CAGR of 5.6% during the forecast period. Some of the major players in the market include Oxford Instruments plc (U.K.), AMETEK, Inc. (U.S.), Bruker Corporation (U.S.), and Thermo Fisher Scientific, Inc. (U.S.), JEOL Ltd. (Japan), FEI Company (U.S.), Shimadzu Corporation (Japan), Rigaku Corporation (Japan), and IXRF Systems, Inc. (U.S.). 4.2.4 Thermo Fisher Scientific, Inc.
7.2.1 Government Funding in the U.S.